Please look at the photo below. What you are seeing is an ADA parking space for disabled individuals that is marked in blue. Disregard the building in the background. The building for this parking space is out of view to the left. Given that, from an ADA perspective, what’s wrong? Answer: Actually, a lot. Some things should be more obvious than others, so here is the list. First, there is no accessible marked parking space aisle. 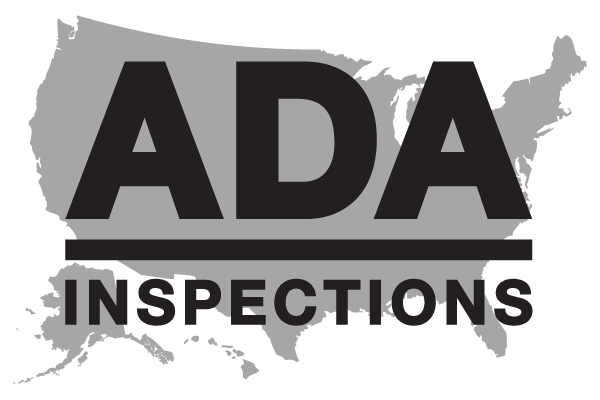 In the 2010 ADA Standards for Accessible Design, Standard 502.2, [Parking Spaces] Vehicle Spaces, states, “Car parking spaces shall be 96 inches (2440 mm) wide minimum and van parking spaces shall be 132 inches (3350 mm) wide minimum, shall be marked to define the width, and shall have an adjacent access aisle complying with [Standard] 502.3. Second, the parking space is not designed or marked as a Van Accessible parking space. 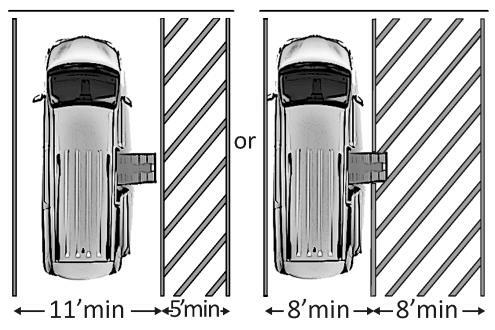 Standard 208.2.4, Van Parking Spaces, states, “For every six or fraction of six parking spaces required by [Standard] 208.2 to comply with [Standard] 502, at least one [parking space] shall be a van parking space complying with [Standard] 502.” The diagram below shows the options for a van accessible parking space. A little more difficult to see is that the grade/slope of the surface of the parking space exceeds the maximums in the standards. The slope measurements of this parking space indicated slopes of between 4% and 6%. Standard 502.4 [Parking Spaces] Floor or Ground Surfaces, states, “Parking spaces and access aisles serving them shall comply with [Standard] 302. Access aisles shall be at the same level as the parking spaces they serve. Changes in level are not permitted. EXCEPTION: Slopes not steeper than 1:48 [2.08%] shall be permitted.” Advisory 502.4, Floor or Ground Surfaces, states, “Access aisles [and parking spaces] are required to be nearly level in all directions to provide a surface for wheelchair transfer to and from vehicles. The exception allows sufficient slope for drainage.” So this space has more than double the allowed slope for a disabled parking space. Again not as easy to see in the photo, but the sign at the end of the ADA space is installed too low to the surface of the parking space. Standard 502.6. [Parking Spaces] Identification, states, “Parking space identification signs shall include the International Symbol of Accessibility complying with [Standard] 703.7.2.1. Signs identifying van parking spaces shall contain the designation “van accessible”. Signs shall be 60 inches (1525 mm) minimum above the finish floor or ground surface measured to the bottom of the sign.” See the diagram belowt for a representation of this signage. So in this case the sign should also say “Van Accessible”, after the space has been renovated to comply.